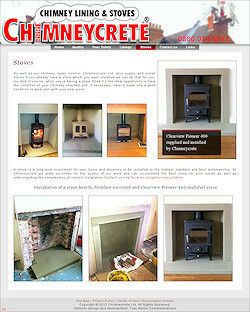 Toby Wallis Communications client Chimneycrete have boosted their marketing with a new and expanded website which includes their new business supplying and installing stoves. The company has expanded significantly over the past few years, with operations now covering all of North, East and West Yorkshire as well as Richmondshire, and needed an updated website to reflect their new status. The new website improves the company’s standing and has clearer calls to action as well as an improved appearance.